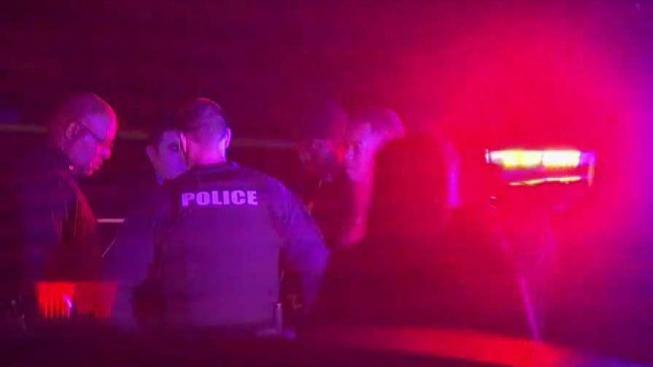 Police have arrested a suspect in the killings of two men in Clinton, Maryland, Thursday night. Prince George's County police responded to the 5900 block of Surratts Village Drive and found 19-year-old Shaquan Chambers suffering from a gunshot wound. Chambers was taken to a hospital where he died a short time later. A short time later, 19-year-old Robert Glasco, of Capitol Heights, arrived at a nearby hospital suffering from a gunshot wound. Police say he also died a short time later. Sean Davis Jr., 20, faces first- and second-degree murder and related charges, police said. Police say Chambers and Glasco were part of two groups of people who knew each other and were meeting for an illegal drug transaction on nearby Sweden Road. The two groups opened fire on each other, police said. A red Jaguar sedan at the scene was riddled with bullet holes. Police believe Davis set up the deal with the intention of robbing the people involved in the transaction. Detectives are asking anyone with information to call 301-772-4925.